Low gas prices and electric cars: Why Tesla and other companies aren’t vulnerable to the price of petroleum. Low gas prices are bad news for hybrid vehicles. But they won’t harm the rise of all-electric cars. Does this Tesla make me look cool? Gas prices are falling. That’s bad news for companies that are trying to sell expensive fuel-efficient cars like hybrids. And it’s especially bad news for companies that sell really expensive cars that don’t use gasoline at all—i.e. electric cars. 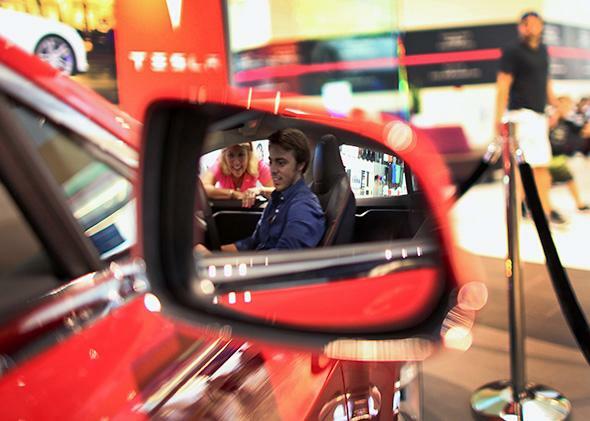 The stock of Tesla Motors has fallen by nearly 30 percent since September. And yet a funny thing has happened as gas prices have fallen. Consumers may be less concerned about losing money at the gas pump, but sales of all-electric cars still soared in 2014. In December, they hit a monthly record. Hybridcars.com publishes a monthly dashboard that chronicles in intricate detail the sales of hybrids, plug-in hybrids, all-electric cars, and cars that run on clean diesel. It’s a fascinating monthly snapshot of the hyper-efficient car market. Crunching the data over the past year reveals some interesting finds. Hybrid cars tend to cost more than their all-gas analogues. So it’s not surprising their appeal has fallen. After peaking at 52,000 in May, monthly hybrid sales fell to about 48,000 in August, and then to about 33,000 in December—a decline of nearly 40 percent. For the entire year, sales of hybrids, at 452,152, were off 8.8 percent from 2013. A similar dynamic can be seen in plug-in electrics—which are hybrids that can run on battery power for a period of time, like the Chevrolet Volt. Monthly sales peaked at 6,651 in May and fell to 3,867 in December, a decline of more than 40 percent. But guess what happened to sales of all-electric cars—you know, the expensive, range-anxiety-producing, economically inefficient baubles like the Tesla and the Nissan Leaf? Hybridcars.com only began to break them out separately as a category in February 2014, when a mere 3,324 were sold. All-electrics had a big May (5,820), and then set another record in August (6,483), before mellowing out a bit and surging to a new record of 7,419 in December. The December total was more than the twice the February total. For the year, sales of all-electrics rose 33 percent to 63,325, with sales showing the greatest year over year momentum in the fall of 2014—just when gas prices and hybrid sales were plummeting. What gives? Well, this is a very small, niche market. So it’s important not to make too much of a few numbers. But my hypothesis has long been that hybrid and electric markets are actually two distinct markets. People buy vehicles for all sorts of reasons. They buy because the vehicle meets their utility—a pickup truck for a handyman, a van for a big family, a Lincoln Town Car for a professional driver. Some make decisions based on fuel efficiency and low cost. But as is often the case with consumer products, many people make vehicle purchase decisions based on how the product makes them feel, or how it makes them look. In the U.S. in particular, the car you drive is a means of expressing your identity. This is particularly true in the high-end market. Nobody needs a $60,000 car to get around town. But plenty of people buy BMWs, Audis, and Porsches precisely because they are status symbols. And that’s the thing with all-electric cars. The people who buy them—and especially those who buy Teslas—aren’t doing it to save a few dollars on gasoline. (If they are, they’re making a very bad trade-off.) They’re doing it because they think the idea of an all-electric sports car is cool, or because they like gadgets and new technology, or because they want to support Tesla CEO Elon Musk, the polymathic hyperentrepreneur who has become a folk hero in Silicon Valley, or because they fret about global warming and want to contribute to a solution, or because they want to call attention to their conspicuous virtue. One of the many Tesla owners in the town where I live has a license plate that reads “NOEMISSIONS.” (Thanks for sharing, pal.) By contrast, hybrids, which were once a marker of cool, have become mainstream, even basic. The other day I snapped a photo of something that would have been unthinkable several years ago: a Prius with a Mitt Romney bumper sticker. What’s more, the electric car doubters also tend to overlook the many incentives—financial and otherwise—that are available to electric-car drivers, beyond lower fuel costs. After San Francisco, Atlanta is the metropolitan area with the second-highest adoption rate of electric vehicles. It’s not because Buckhead is filled with emissions-phobic tree huggers. Rather, as the Wall Street Journal reported last year, the government and private companies are putting their fingers on the scale. There’s a state income tax credit that averages $4,000 for electric car purchases, and the region’s big utility lets people charge at night on electricity that is practically free—1.3 cents per kilowatt-hour. Big local employers like Coca-Cola have installed parking spots with charging equipment at their headquarters. In Atlanta and elsewhere, other incentives push people to purchase electric vehicles—regardless of the level of gas prices. In California, people who drive zero-emissions cars are eligible for stickers that let them drive in high-occupancy lanes as single drivers. That can save an immense amount of time and frustration. In Westport, Connecticut, where I live, there are special parking areas at the train station where you can charge your electric car. By my reckoning, the convenience of parking there can shave 10 minutes off your daily commute. Electric cars, which are a new, challenging product, become more appealing and less scary the more people and companies get involved with them. Range anxiety—the fear that a car will run out of charge and then have to spend a lot of time charging up—is one of the big factors tamping down their growth. But utilities and auto manufacturers are loudly announcing plans to build out charging capacity. In January alone, a Kansas City utility announced it would build 1,000 charging stations in its service area and Volkswagen, BMW, and ChargePoint said they would collaborate to add 100 fast chargers on the coasts. The more people promote, evangelize for, and demonstrate electric vehicles, the more people will buy them. In December 2014, Hybridcars.com counted 13 different models of all-electric cars on the market, up from nine earlier in the year. There’s Tesla and Nissan, yes. But now there’s the VW’s e-Golf, and the BMW i3, whose charming ad featuring Bryant Gumbel and Katie Couric was one of the winners of the Super Bowl. Via Motors, run by Detroit legend Bob Lutz, is turning pickup trucks and vans into all-electric vehicles. Proterra is making all-electric buses. Yes, it’s still small and in its infancy. But the electric car market in 2014 showed signs of becoming a thing. And this thing has very little to do with the price of gas.